Within weeks of returning home from service with the 125th Pennsylvania, Jacob Higgins found himself heading back to the army. In early June 1863, the Army of Northern Virginia was once again moving northward toward Maryland and Pennsylvania. A small Union force, under Brig. Gen. Robert Milroy, was scattered from their post at Winchester, VA as the rebels advanced. 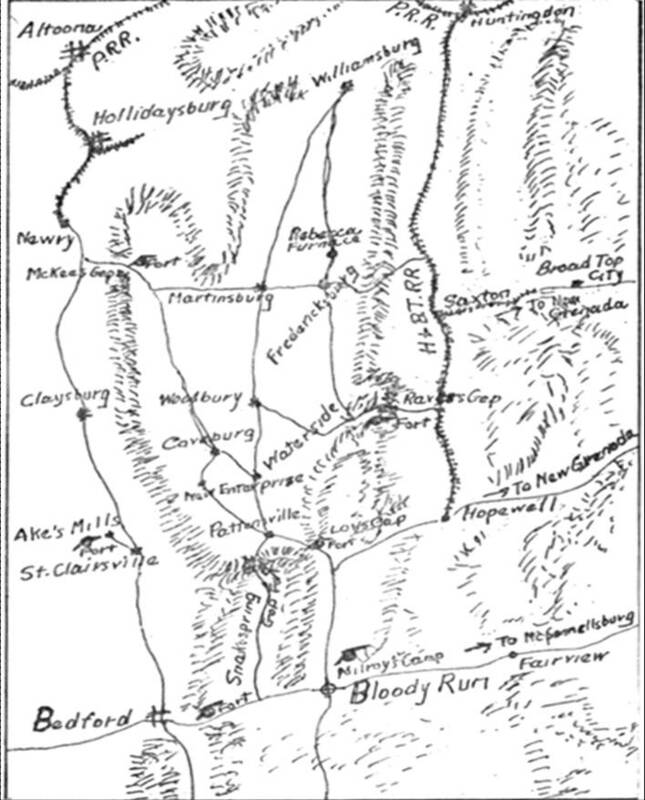 Some of Milroy’s force fled east to Harper’s Ferry, but most, including Milroy, fled north into Pennsylvania, all the way to Bloody Run [now Everett], Hollidaysburg, and Altoona. As in September 1862, panic began to spread through Pennsylvania, as it looked more and more likely that the Rebel army would soon be invading the Commonwealth. An “Emergency” force of Pennsylvanians would again be called upon. Col. Higgins quickly began to bring together men from the region. 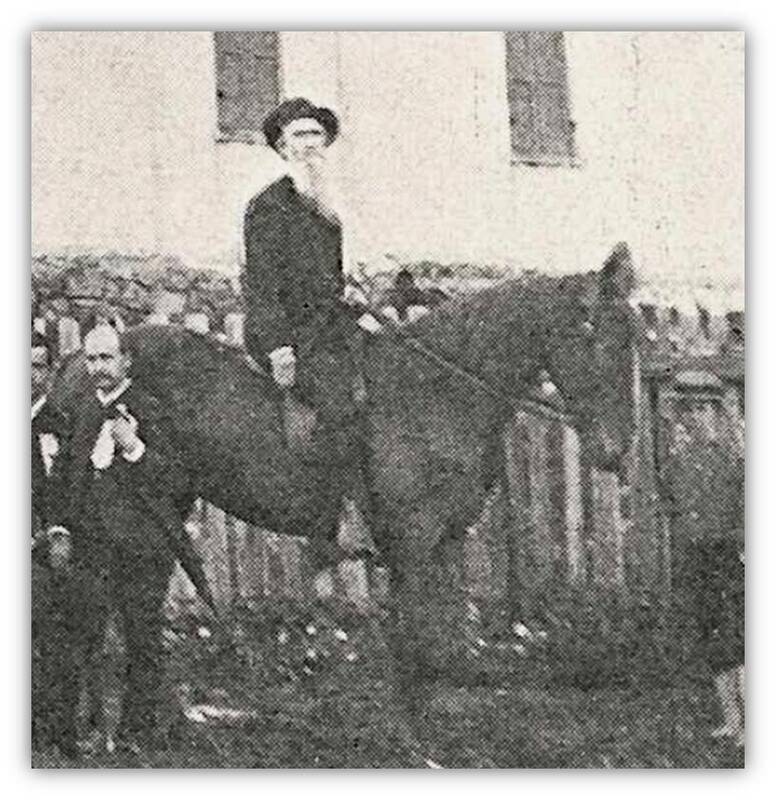 Having commanded militia units in the Hollidaysburg area for many years before the war, Higgins knew just where to look for brave men to answer the call of “emergency”. Men from the railroad shops of Altoona, and the iron foundry at Duncansville turned out, as did farmers, carpenters, shop keepers, clerks, and miners from every corner of the region. The officer pool that Higgins had to select from were surprisingly skilled and experienced, and well known by Higgins, since many were former members of the 125th Pennsylvania. Men like Lt. Col. Jacob Szink, who left his job as foreman of the blacksmith shop at the Pennsylvania Railroad’s Altoona Works. Szink also recruited many of his own shop workers to follow him to Higgins’ call. Other men like Capts. William Wallace and Ulysses Huyett, of Cos. C and A respectfully, and undoubtedly countless more who were ready and willing to drop everything and face Lee’s hoards once again. A large group of 125th veterans organized in Mt. Union (in eastern Huntingdon County), under the command of their former Major, John J. Lawrence, who was now made Colonel of the 46th Pennsylvania Emergency Militia. The 46th would later end their “emergency” service in Philadelphia, where Harrisburg was afraid draft riots would break out just as they had in New York City. While Higgins estimated that the force he was able to bring together numbered approximately 1,400 men, that number would ebb and flow over the course of the “emergency”. Higgins’ troops were never officially mustered into state or federal service, and were, in fact, completely free to come and go as they pleased, just as the “Minute Men” of the Revolution. During periods when it appeared that the region was most threatened by the Rebels’ advance, Higgins’ ranks would swell with men, ready to protect their homes, no matter how many of the enemy they might face. For a brief time, a battalion of Emergency militiamen from Johnstown, commanded by William McCartney, former Lt. Col. of the 133rd Pennsylvania, arrived in Altoona and marched through Morrison’s Cove. McCartney’s force quickly returned to the defenses of Johnstown when fears rose that the Rebels would soon be within striking distance of the city. At the height of the invasion into Fulton, Bedford, and Blair Counties, it is thought that Higgins’ force reached nearly 2,500 men. Once men began to assemble into Higgins’ force, he quickly put them to work. Using the abundant trees and large boulders of the mountainous region, Higgins’ men constructed crib barriers, filled with stone, approximately eight feet wide and seven feet high, at the vital mountain passes and streams that could be used by the advancing Rebels. “We need…Chains, Ropes & Axes,” wrote one of Higgins’s Captains, “By building fires we can work most of the night. Send on fresh men as fast as possible. 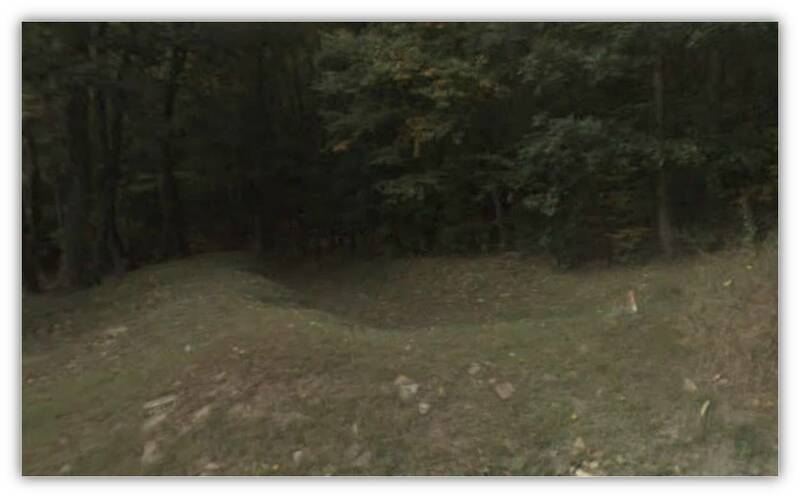 Even in small squads they can be put to work at once.” At other locations, they dug systems of trenches, which can still be seen today along side Lower Snakespring Rd, north of Everett (noted as the ‘Snakespring Gap Fort’ on Higgins map). Today, the spot is marked by a Pennsylvania State Historical Marker. Sometime around June 17, while the hastened defensive construction in the passes continued, Higgins ordered Lt. Col. Szink to move south from Altoona and Hollidaysburg with a force of roughly 400 men, towards Bedford. This force under Szink would push south and east toward the direction of the oncoming enemy. On their march, Szink came upon some of Milroy’s forces still making their exhaustive journey northward toward Altoona. Szink’s brave band constructed small fortifications and road blocks all along the way. Being the veteran that he was, Higgins must have realized that if the Rebel army was indeed moving on Altoona, Szink’s force would be no match for the oncoming hordes. However, rather than sit in the mountain passes and wait for the waves of gray to crash up the slopes, a strong reconnaissance was necessary. 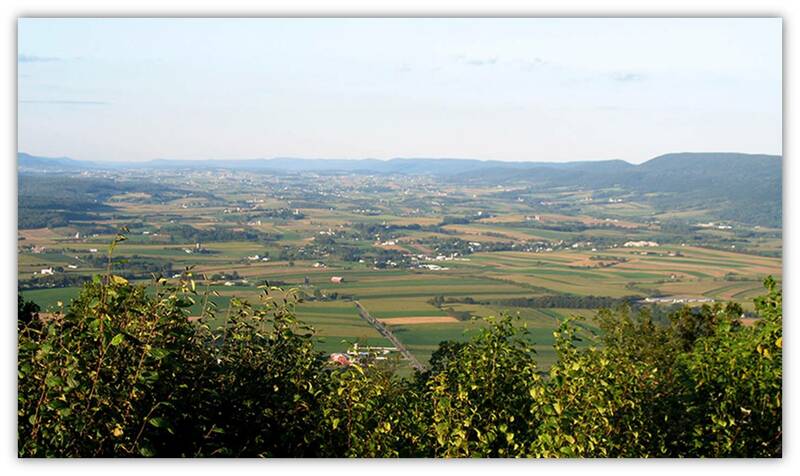 Word soon reached the Rebel army marching in the Cumberland Valley, that fortifications were being constructed in the mountains to the west. 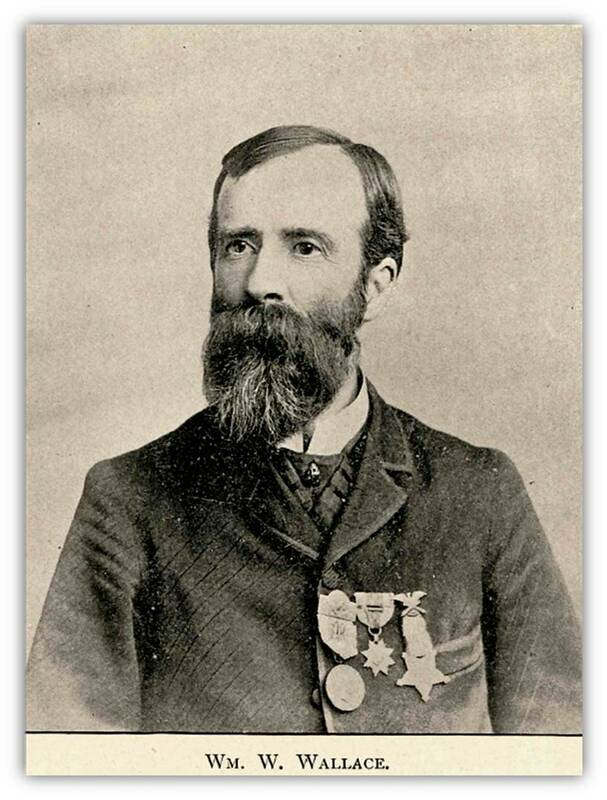 Confederates under Gen. George Hume Steuart started on the roads headed west toward Mercersburg, and McConnellsburg [roughly 40 miles east of Bedford] to determine who was defending the passes. On June 24, a very small, joint force of Milroy’s cavalry, and a squad of militia men [many former members of Higgins’ 125th PA] under Capt. William Wallace startled a detachment of Rebel cavalry, that was sent to probe the mountain passes above McConnellsburg. Cautiously the next day, Steuart’s infantry searched the mountainside for the phantom Union force that had fired on the Rebel horsemen. Wallace managed to retreat north to Fort Littleton, and Szink, who had also marched to McConnellsburg, had been able to escape back to the safety of the fortifications at Bloody Run. The quick confrontation helped slow the advance of the Confederates, who regrouped after the attack by the unknown enemy force, of unknown strength. Over the next several days, Higgins continued to have his men construct fortifications, while he did all in his power to turn out more men for his force, as well as secure supplies for the defense of the region. On the 28th of June, another wave of rebels entered the region, under the command of Gen. John Imboden. However, Imboden’s cavalry troopers were surprised and run off by another small group of Milroy’s cavalry, and mounted militiamen. Though Higgins’ did not know it at the time, this small skirmish would be the last Southern push into the region. As word that the Union army was fast approaching the Rebel army, and without the vital reconnaissance of Jeb Stuart’s cavalry, Gen. Robert E. Lee began to concentrate his forces east of the Cumberland Valley. Days later, on July 1, the opening shots of the great Battle of Gettysburg would change, for the better, the military landscape for Higgins, and the region he bravely defended. With the defeat of Lee and his army, and their retreat back into Virginia, came and end to the “Emergency.” Higgins, and his men, soon returned to the homes they so quickly rushed to defend. As eventful as Higgins’ story had been so far, the closing of the Gettysburg Campaign did not at all bring an end to his involvement in the war. 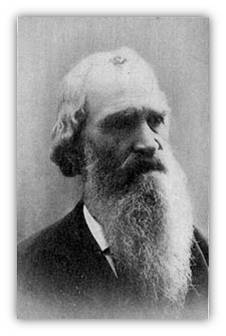 In early 1864, he helped raise what would become the nucleus of the 22nd Pennsylvania Cavalry, and would lead them in battles and skirmishes in West Virginia and the Shenandoah Valley. Several times, Higgins was placed in command of the brigade in which the 22nd was a part, as well as the cavalry division of Gen. Julius Stahel. Higgins was finally mustered out of service on July 21, 1865. After the war, Higgins worked closely with Cambria Iron Co. in Johnstown. He also ran the Henrietta Hotel, in Henrietta, PA. Remaining active with his fellow veterans, Higgins was also a member of the local G.A.R. post. In 1888, on the 26th Anniversary of the Battle of Antietam, Higgins, and other survivors of the 125th Pennsylvania, returned to site of their first fight; to remember comrades, to recall past glories, and to find meaning in an event so terrible. To commemorate the occasion, the veterans present had their photograph taken behind the now famous Dunker Church, site of the 125th’s “baptism of fire”. At the right of the image can be seen a 62 year old Higgins, on horseback, just as he would have been as he lead his men into battle exactly 26 years before. 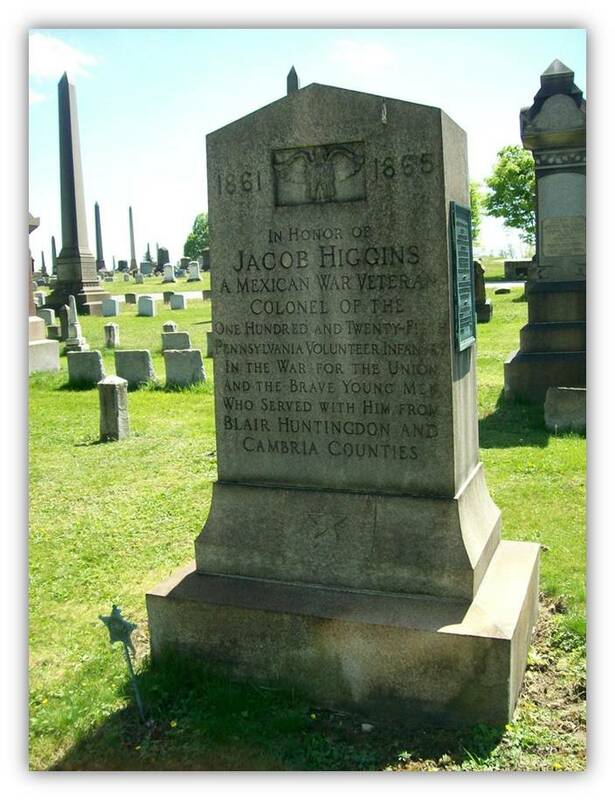 Jacob C. Higgins passed away on June 1, 1893, and was buried in Grandview Cemetery in Johnstown, PA. In 1921, the last remaining veterans of the 125th placed a memorial stone at Higgins’ grave, illustrating that nearly 60 years after the events, and 33 years after his death, Jacob Higgins was still beloved and remembered for the life of service and bravery he rendered to his country, his state, his home, and his comrades. 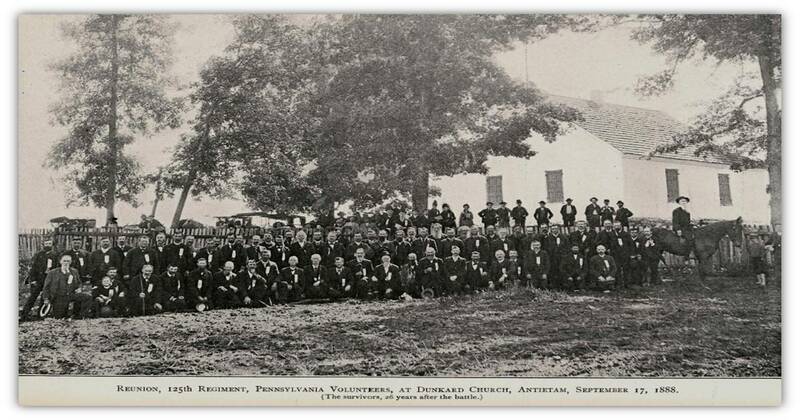 “125th Pennsylvania Volunteers Organization and Service”, accessed 20 December 2011. available from http://www.pa-roots.com/pacw/infantry/125th/125thorg.html; Internet. “22th Cavalry Regiment Pennsylvania Volunteers”. accessed 28 December 2011. available from http://www.pa-roots.com/pacw/cavalry/22ndcav3yrs/22ndcavorg.html; Internet. Bates, Samuel P. History of Pennsylvania volunteers, 1861-5 : prepared in compliance with acts of the legislature. Harrisburg: B. Singerly, State Printer, 1869. Burgess, Milton V. Minute Men of Pennsylvania. Martinsburg, PA: Morrison Cove Herald, 1962. “Col Jacobs Higgins’ Official Report”, accessed 20 December 2011. available from http://antietam.aotw.org/exhibit.php?exhibit_id=343; Internet. Karns, Rev. C. W. Historical Sketches of Morrisons Cove. Altoona, PA: Mirror Press [originally printed in the Altoona Mirror], 1933. Regimental Committee, The. History of the One Hundred and Twenty-fifth Regiment Pennsylvania Volunteers 1862-1863. Philadelphia: J. B. Lippincott Co., 1906. Storey, Henry Wilson. History of Cambria County Pennsylvania, vol. II. New York: The Lewis Publishing Company, 1907. United States War Department. The War of the Rebellion: a Compilation of the Official Records of Union and Confederate Armies, Series I, Vol. XXVII, Part III. US Government Printing Office, 1889. Dave..please call me re private tour…DOUG FRASER..
To schedule Dave, or any Antietam Guide, you’ll have to first contact the Antietam Bookstore (301) 432-4329, or by email at wmia@hughes.net.